Put engraving info in gift message or message seller after purchasing. This listing is for a TSM Trading Cat Collar with Bell, adjustable in size fits up to a 30cm neck comes with a 27mm glitter paw shape ID tag and a split ring, available in a choice of 4 colours, please specify in the drop down list. 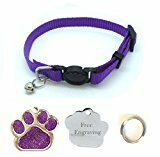 This entry was posted in Uncategorized and tagged bell, Collar, Engraved, Free, Glitter, Purple, Quick, Release by One Boutique. Bookmark the permalink.